" To avoid any restriction on a horse's natural harmony and grace, but rather to encourage its suppleness and sheer pleasure in its own movement" is the ultimate aim of Rudolf Zeilinger. - one of the most talented pupils of the late Willi Schultheis, and himself a trainer of Olympic and World Championship horses. Rudolf is well known for the gentle and sensitive way he trains dressage horses. encouraging them to develop a relaxed, confident and athletic way of going, combined with a happy forward thinking attitude to their work. DVDs are each approximately 55 minutes. Individually priced at $49.95 plus s/h. for just $209.95 plus $7.75 for s/h. 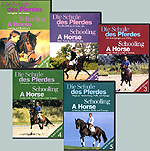 Rudolf Zeilinger is well-known for the gentle and sensitive way he trains dressage horses. Part 1 covers the first seven weeks of the training of two rising four-year-old horses from the day they arrive at Rudolf's yard. The work centers on the first 3 elements of the training scale: rhythm, suppleness, and contact. Rudolf Zeilinger is well-known for the gentle and sensitive way he trains dressage horses. In Part 2, using a variety of four-year-old horses, Rudolf demonstrates the continuation of early training introduced in Part 1 and shows work to develop impulsion, straightening, and collection. The benefits of having established the principles of early training are evident in the way the horses accept the demands of more difficult exercises, whilst maintaining their motivation and enjoyment of the work. For Rudolf Zeilinger, lateral work is an essential element in a horse's dressage training. In Part 3, Rudolf demonstrates lateral work with his own horses, explaining when to begin, what requirements have to be fulfilled, and how he works individually with horses which vary greatly in temperament and training level. Rudolf Zeilinger realistically shows how even difficult horses can learn to do the flying change without experiencing stress in the process. Rudolf also clearly demonstrates his entire cantering work up to the level of perfect half passes, canter pirouettes and flying changes from one stride to the next. The counter canter and flying changes are the main aspects dealt with in part 4. Rudolf Zeilinger shows his sensitive training method and provides hints and examples for achieving the 'High School' movements of collection, Piaffe and Passage. There are different ways of teaching these High School movements. Here, Rudolf Zeilinger shows his sensitive training method and provides interesting hints and examples. This video will be a valuable guide for both amateurs and professionals.